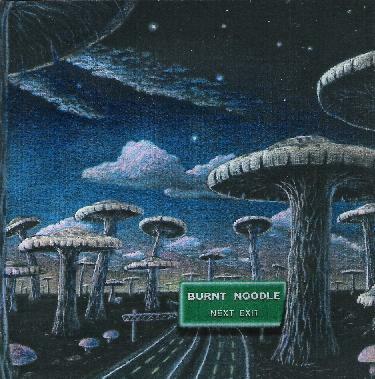 Burnt Noodle - "Next Exit"
Burnt Noodle are a group of psychedelic freaks from Northern California who get together every now and then and make improvised jam sessions and then mix the best bits of them together and add strange samples and overdubs. They are very creative and funny and have a good sense of humor as well as play very well. Bipolar begins the CD with some strange samples but is mostly instrumental and features some spacey guitar playing and synthesizers. Day by Day is a Tom Hardy composition and he sings and plays the guitar. The track is quite inspired by Pink Floyd and develops into a spacey jam. They clearly have a lot of fun if you listen to the little bits they piece in between the tracks. At the beginning of On and On they are talking about their drummer Mark and keep saying something about "We're in Milwaukee". The jams begins with some cool slide guitar as it slowly builds up over the next 10 minutes and features Paul in the lead vocal (strange lyrics). I love the way these guys get spaced out. Brilliant psychedelic stuff! Road Flick features Kirana on vocals and begins as a pretty ambient piece with e-bow and mellotron but then gets very psychedelic and strange, as it should! From here on the CD gets even stranger with Uncap Your Brain and Jim Meets the Space Aliens. Uncap Your Brain has some strange conversations between Reverend Ron and Dr. Bob as the band gets spaced out ala Pink Floyd with some Capt. Beefheart thrown in the mix. Inside the CD booklet and also on the web page you can read the story behind Jim Meets the Space Aliens. It is strange and a 15 minute trip to end this excellent CD. Even better than their other CD that I own. For more information you can visit the Burnt Noodle web site at: http://www.burntnoodle.com.